Today is March 31st – the final day of the March Slice of Life – the daily writing challenge hosted at “Two Writing Teachers”. Today is the last day of our march Slice of Life challenge. It’s appropriate that I write the luncheon I had yesterday with a local writer. We had met online and arranged to meet, for lunch at a lovely university restaurant. We both had the quiche and salad – delicious. We discovered we had taken many of the same courses and are taking part in several of the same challenges. We’ve decided to exchange picture book manuscripts and critique each other’s work. Reaching out to her seemed much easier after reaching out to others this month. I had taken part in last year’s March challenge but this year I seemed to connect more. I was moved to tears many times, laughed often and was definitely inspired by many slicers. I feel I learned so much about the lives of many slicers as well. The habit of daily writing has helped with my other writing. I will continue with the Tuesday challenge, being sure to continue with those connections made. Thank you to the Challenge team for running the March Slice of Life . It has been a wonderful, daily experience. 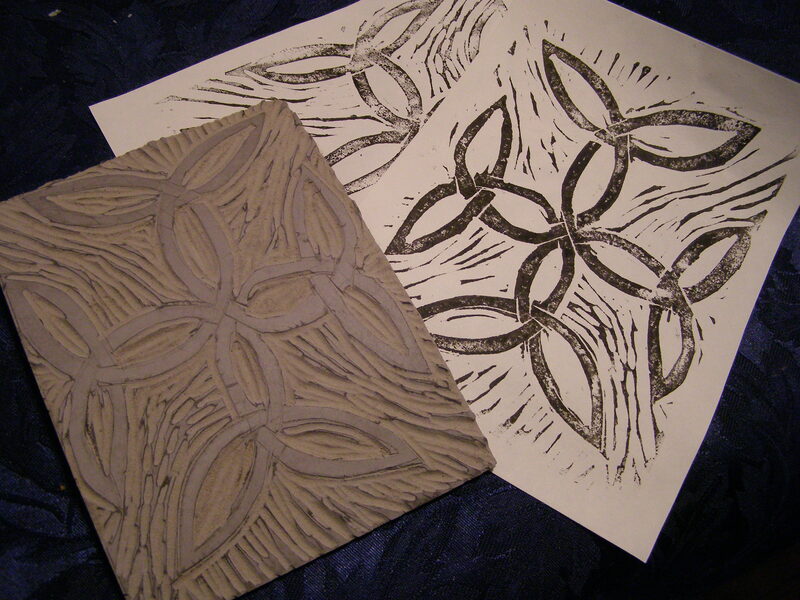 Yesterday afternoon I spent a few hours learning how to create a lino block print. I have done a fair bit of printmaking and really enjoy creating my own stamps. The workshop took place at the MCDougall Cottage – an 1858 granite and limestone cottage. It hosts special events that celebrate the area’s Scottish heritage. I have been to a number of art shows and even a ceildh – a musical concert of traditional music. It was a full 3 ½ hour workshop and I didn’t quite finish, although I got to print and see what needs to be altered..I still have some fine carving to do – but this I can do at home. There were only 7 of us so we got lots of individual attention. I enjoyed the process, but I do prefer the softer speedball block that I use for carving my stamps. It is hard to believe that we are almost at an end of the March Slice of Life challenge. I have posted a slice everyday. Some days the inspiration wasn’t there and then I read another slicer’s post and I was inspired by something they had shared. Today’s slice was inspired by Barbara, who created a Slice of Life acrostic. I used acrostics often in my classroom to spark poems in my students. They loved this form, as do I.
O – One slice a day, 31 in all. E – Ever more – united; a community of story-tellers, writers; forever changed. Tonight is Earth Hour, when from 8:30 to 9:30, we are asked to turn off all lights. It is a yearly global event that hopes to raise awareness about climate change. It began in 2007 and has grown now to where millions around the world take part and host parties and events. It is truly a grassroots event that has led to much needed awareness about the environment. The theme this year is climate change. When I was teaching, I encouraged my students to take part and we shared ideas of what we all could do during that hour. There’s something about sitting in darkness, with just a few candles flickering, that is restful. When we have gone outside, the skies seem so much fuller of stars. I’m hoping that tonight it won’t be too cloudy so that we can look at the stars. Earth Day has always been a favourite day to celebrate when I was teaching – its theme of environmental awareness though extended throughout the year. I tried to plan numerous activities for the week around Earth Day for our class and school. Kids were so involved and thankfully so – they are our future. Last night we went to see the musical “Wizard of Oz” with my husband’s two daughters and granddaughter. What an amazing show – LOVED it! It was well acted, the songs were wonderful, with gorgeous sets. We had fantastic seats as well – third row! Knowing this story so well, it was a treat to see and hear the famous scenes and songs. Dorothy was played by A.J. Bridel, who turned just 21 yesterday. The audience even sang happy birthday to her when she gave her bows at the end. There was a long standing ovation at the end. A special treat was having Dorothy, Glinda and the witch come out after the performance and let people have their pictures with the. Our granddaughter got a group shot – she was excited! The Dunfield is the new theatre in our city and it has already presented some incredible shows – Les Mis. (my favourit), Peter Pan, Little Mermaid, and lots of others. We will be attending a number of shows this year. Can’t Wait! Today is Day 26 of the March Slice of Life – the daily writing challenge hosted at “Two Writing Teachers”. Today is also “30 Words Thursday”, a writing/ photography challenge hosted at “Treasures Found”. Form a photo taken, you are then to write 30 words about it. 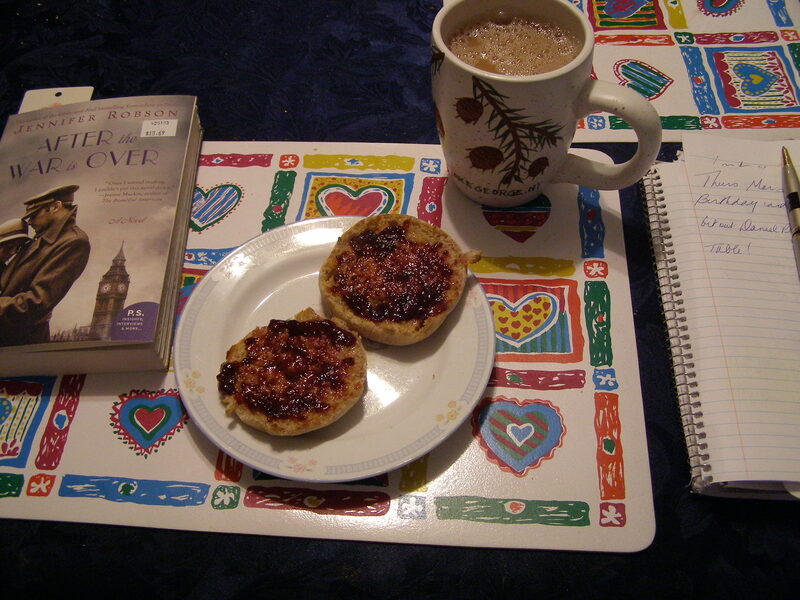 I had no idea what I was going to write about today until I set my plate with a toasted English muffin on the table and saw – my mid-morning ritual. That was the inspiration for my poem. Each Sunday and Wednesday the ROW 80 community posts their progress from the preceding week. This, really helps us focus on our writing and what goals we want to achieve. We are now at the end of round 1. It seems to have zipped by. Yes, I did accomplish a number of goals but I felt that overall I could have done better – that I wasn’t consistent with daily writing. I had a roller coaster at times of how I approached writing and several times became discouraged. Round 2 starts April 6 and I am working on setting realistic goals, but also ones that will stretch me. I do want to improve as a writer but would also like to be published. Big dream! My goals are listed here for this round in bold, and below each, is the progress for this round as well as my reflection..
Write daily – at least 500-1000 words a day. Most days I met the minimum and several days I wrote well over 2000 words. I worked on completing several projects but would have preferred to be more consistent. I took several courses during this round and enjoyed them. Two were through RWA and were quite informative. Several were through writing blogs and were on the craft of picture book writing. I will continue with courses this next round. I read 2 of the 3 I planned to read. But I read numerous articles, at least one a day. There are so many wonderful writers who are so willing to share their knowledge and I follow many of them. I will continue this as well. Yes, I finished it – over 40,000 words – my first full-length novel. I tend to write novellas so this was a special one. I also loved the characters wo this was enjoyable to write. I have started revisions and my goal is to enter the SYTYCW competition in October through Harlequin. I did not finish this novel. I have continued to brainstorm, plan but writing just wasn’t working. I have started a chapter book and have several chapters written. I hope to work on both next round. Yes, I wrote one a month and have continued to work on revisions of several others. I am submitting one to the SCWBI “Late Bloomer Award” contest by the end of the week. I will continue this through Round 2. I have taken part in several twitter pitch parties and have actually received two requests. One I was offered a contract but did not accept it The timing wasn’t right but I still have hopes for that novella. I also submitted a proposal to “Blaze” following their request for manuscripts. Fingers and toes crossed. I am working on picture book writing and revisions for 12 x 12 and am submitting to Rate Your Story for feedback as well as my critique groups. I haven’t participated in Write1Sub1 although I am trying. Yes, I have done this and really enjoyed meeting other “Rowers”. I’ve tried to visit others as well. I usually write a post for “Slice of Life” on Tuesday” and one for “30 Words Thursday”. This month I have also taken part in the daily “March Slice of Life”. In April I plan to participate in the daily “A to Z Challenge. I also blog at my art blog and write several posts a week there. For those who aren’t familiar, WIPpet Wednesday gives writers the chance to share excerpts from their works in progress (WIPs) on their blogs. The snippet must relate to the date in some way. Emma and Flynn have had lunch with Flynn’s mom and now he has to leave. Emma stays. “Maybe this is a bad idea.” Flynn crossed his arms. “And so she should be Flynn.” Emma envied the obvious loving relationship these two had. With her own parents, there had been love, but not this affectionate sparring. Flynn hugged his mom and then Emma. “I’ll you later. Have a good time.” He headed out. I always wrote, whether short stories, in my journal, letters and later, blog posts. But I never called myself “a writer”. I desired to be one, but I didn’t take any concrete steps while I was teaching. In June of 2013, I retired after 36 years in education. I loved teaching but I knew it was time to leave. I also know it was time to pursue my desire to write. I took courses, joined writing groups (SCWBI, RWA) , read, attended a retreat, joined critique groups and I wrote. I took part in challenges (ROW 80), pitches and twitter contests. And, I kept writing. I did NaNoWriMo twice and wrote 50,000 words both times. I took part in SYTYCW through Harlequin twice as well. I’ve written romance novellas, several children’s picture books and non-fiction books as well as starting a middle grade novel. I just finished a full-length novel that I have started to revise. I have dreams and so I keep writing. I tend to picture a scene or a character in my mind long before I start to plan or write. Once that image solidifies, I then write it down as I saw it. The scene usually arrives as a movie clip. I tend to write sparingly and am working to expand my writing, to add more detail, thoughts and descriptions. I wish I could be more consistent in my daily writing, that I could write religiously every day. But, even when I am not writing, I am thinking, planning, getting new ideas. I continue to study, to seek to improve my skills. I call myself a writer now and I keep writing. 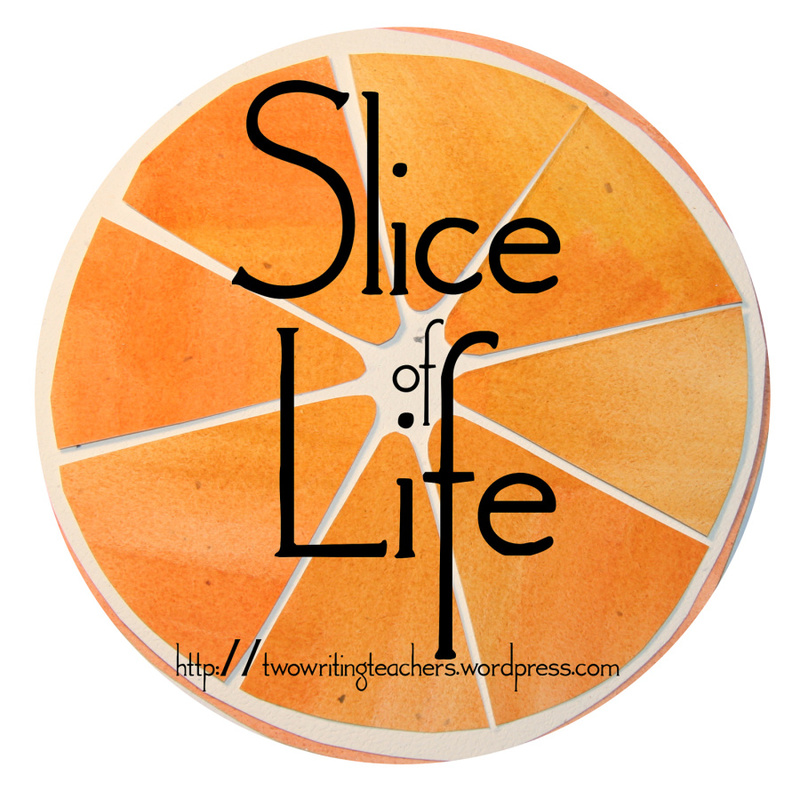 Today is Day 24 of the March Slice of Life – a daily writing challenge hosted at “Two Writing Teachers”. It was such a lovely day yesterday tt head downtown – sunny, warmer although it was still no cool. But I didn’t even need a hat or mitts. During the bus ride, I brainstormed character traits for a novel and looked at the city and the people on the bus. My first stop was the library where I walked through their gallery. It was hosting children’s art from schools around the city. What a treat! Then I checked for new children’s books and magazines. My last stop was to pick up the reserved books and check them out. I love that I can order books online late at night and then in a few days they are waiting for me.I can also check that I have no over dues and can renew online as well. My next stop was at the hospital thrift shop to check for books and utensils. Bought a couple of children’s books but no utensils. Once home, I did some writing, then read. And it was “Voice” night – so all in all, a perfect day! As part of a study of picture books that I have been participating in this month (visit here), I read “Once Upon a Memory” by Nina laden and illustrated by Renata Liwska yesterday. It was written as a series of questions and focused on what do we remember. It was the the last page though that captured me the most. Both the author and illustrator listed some of their favourite things to remember. So many of the slicers have used lists in many different ways and I have done as well. I decided to look back and create a list poem of thins I remember from my early years – many of the things that we do not use or even have now.